What better way to refresh your home, add color, make a subtle change! 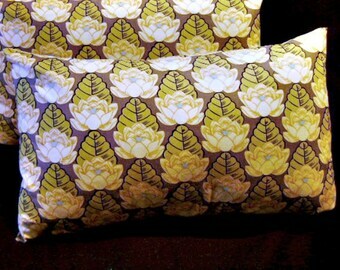 Two pillow covers available, buy them separately or together. A vibrant print by Joel Dewberry featuring multiple shades of green, cream, and pops fuschia (or would you call that magenta?) is used for this pair of 12 inch x 20 inch pillow cover with envelope back. Fabric is 100% cotton. 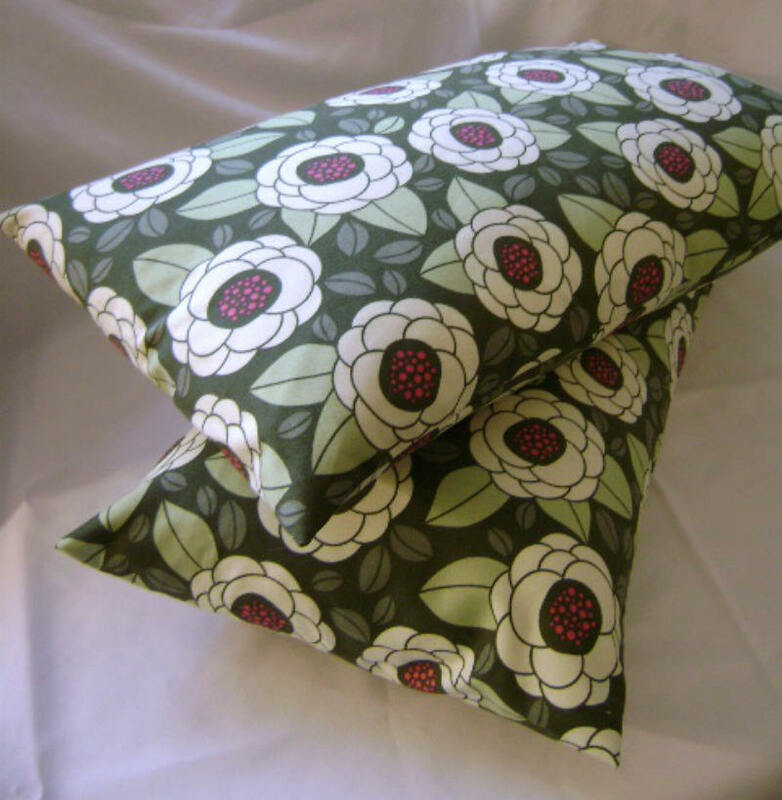 The pillow insert is not included but can be purchased at any craft, fabric, or discount store. These pillow covers will fit over a 12” x 20” insert. We recommend wrapping your pillow inserts in a layer of batting for added loft and fullness. Dry cleaning is recommended. Note: pillow covers are made smaller than the recommended insert in order to achieve a tight, neat fit and appearance. All Lilikins Baby + Home products are made in a smoke free environment. Your purchase will arrive wrapped in tissue paper with a ribbon and tag closure suitable for gift giving. Although Lilikins strives for perfection we know that nothing in life is "perfect" and there will always be some flaws. This is especially true with handmade items making them all that much more unique. Please understand before you make your purchase that there might be some small imperfections, but rest assured that every item has been carefully crafted and Lilikins would never offer an item for sale if we weren't comfortable putting our name on it. Please see shop policies regarding shipping information (Canadian / International orders, etc). Very darling stocking...will make a nice gift!! Perfect gift for my best friends daughters little boy! Great job. Very fast delivery. Beautiful work. Delivery address should be the same as the address associated with the account you are making payment with, if you want your purchase shipped to another address there may be a delay while your payment is verified, please note this is to protect both the buyer and seller. It is my goal that you are pleased with everything you purchase from Lilikins Baby + Home. Refunds will be offered for the item purchase price if you are unsatisfied. Please contact me within one week of receipt to initiate this process. Kindly contact me regarding any issue you experience with your item, I want to work with you and I am confident a mutually agreeable resolution will be found should there be any problem. We will be using USPS priority mailers whenever possible. **Any overage charged on postage above $1.00 will be refunded. Items will be shipped within 2-3 business days of receipt of payment, if for any reason we are unable to meet this timeline you will be notified. In order to protect both the buyer and seller delivery confirmation will be included for each shipment posted using USPS. ***If multiple items are purchased we will do all we can to limit your postage costs and refund the balance to you (this especially applies to the de-stash section). ***Rates noted apply to US orders only. We are happy to ship internationally, however, we do request that Canadian / International Buyers contact us, we will respond as quickly as possible with the appropriate shipping rates. ***Shipping policy may be subject to change based on performance / customer satisfaction. All fabrics used for baby items were laundered prior to sewing. All items will arrive wrapped in tissue paper with a ribbon and tag closure, appropriate for gift giving. Baby Items: Machine wash and dry on medium, no chlorine bleach. Light ironing if needed. Home Items: Dry cleaning recommended unless otherwise noted. All Lilikins Baby + Home items have been created in a smoke free environment.